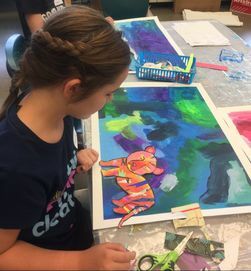 Whether it’s grizzly bears in the mountains, zebras at the zoo, or Old MacDonald’s cows on the farm, our campers will step into the world of animals. But hold your horses! This isn’t a one trick pony week, it’s an Art and Story Week! Meg Foster will guide the children through a week filled with color and fantastic art inspired by the animals of the world. At the same time, Ali Pfautz, The Story Lady, will guide the children as they create animal stories. Anything goes! Campers might imagine four legged critters who talk or winged birds who set out for adventure. One thing’s for sure, this week will be the cat’s meow. Our week will end with a spectacular performance for our families! (Campers will be divided into age-appropriate small groups). All materials provided! Our camp week ends with an amazing dramatic performance & an art show of all of our children's beautiful works! After receiving her BFA in Art Education from VCU, Meg taught in Chesterfield County Public Schools for over 13 years. With a passion for teaching art to young children, she was recognized by her fellow teachers in 1996 and was awarded Teacher of the Year at Harrowgate Elementary in Chester, VA. Before taking time off to stay home with her two young children, Meg was the art teacher at Robious Elementary for 7 years. As a way to return to her passion of teaching, she started with after school classes; "Arthaus Kids," in the fall of 2008. The dream of ArtHaus Visual Arts Studio came together when the new studio opened in September 2010. Meg is currently the Lower School Art Teacher at St. Christopher's School in Richmond, VA.
"I've rambled down many paths through the years. I've been a dancer and drama teacher, a news writer/producer, a TV anchor. No matter what day job I had, I always kept a journal or notepad close by to scribble my latest musings, a poem or story. I come from a musical family full of educators and big readers. I'm proud to continue that creative vibe in my life today. I love what I do and that keeps a smile on my face. I believe in the power of a smile!"